Genacross Lutheran Services has begun a $1.1 million interior renovation of the Health Center on the Genacross Lutheran Services-Napoleon Campus, formerly Lutheran Home at Napoleon. Renovations include general updates of interior finishes and some room layout changes, which affect approximately 18,000 square feet of the 45,000 square-foot facility. “The interior renovations project underway at the Napoleon Campus illustrates the organization’s ongoing commitment to providing a positive health care experience for patients and residents,” stated Denise Gannon, Vice President of Poste-Acute Services. Generate a warm, home-like environment for long-term residents that will feature distinctive touches and be more conducive to personal choice. The Health Center will experience many changes, including new flooring, paint and wall coverings, and LED lighting in most common areas. 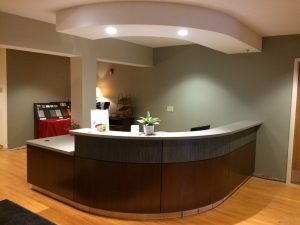 The scope of work includes updates to the lobby, chapel, and main corridors, and an expansion of the existing therapy space. In addition, the east and west resident wings will see major alterations: removal of central nurses’ stations, creation of new work areas and medication rooms, complete renovation of central baths, and re-configuring of dining rooms. Work began primarily on the west side of the building in November 2016 and will progress to the east side, with other areas sequenced in as they are available and in order to minimize the disruption to patients, residents, and on-going operations. Completion is expected in summer 2017. The existing building was first constructed in the early 1980s, with an addition (lobby, offices, and chapel) and updated finishes completed in the late 1990s. The architect for the project is Duket Architects Planners in Toledo; the general contractor is Rupp/Rosebrock in Liberty Center; the mechanical, electrical and plumbing contractor is JDRM Engineering in Sylvania; and the interior design firm is Buffy McConnell Interior Design in Toledo.